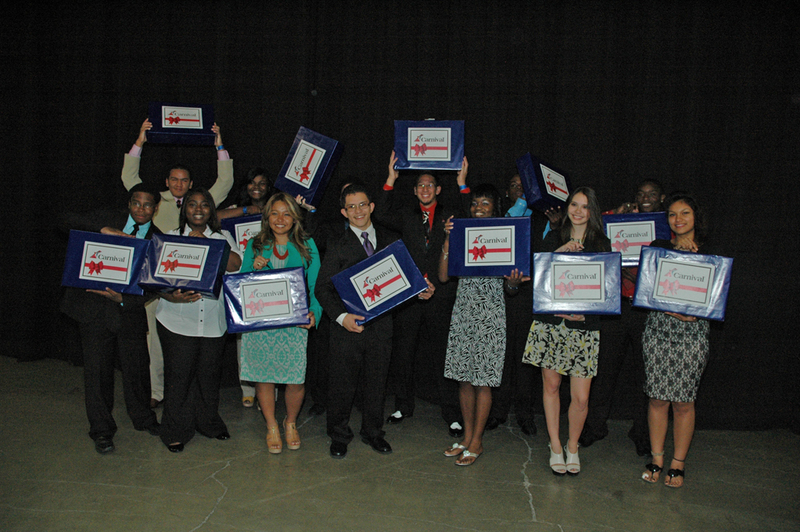 During last night’s Miami HEAT game, Miami-based Carnival Corporation & plc and its flagship brand, Carnival Cruise Lines, presented full four-year scholarships to 13 local high school seniors who are participating in an innovative workplace mentoring program operated in conjunction with the Miami HEAT and Big Brothers Big Sisters of Greater Miami. Each student also received a laptop computer, compliments of Carnival. The students are graduates of the Carnival-sponsored HEAT Academy, an after-school enrichment program for third- to fifth-grade students. Since completing the program, Carnival has tracked their academic progress through middle school and the students were then selected to participate in the workplace mentoring program during high school. The workplace mentoring program pairs nearly 100 local high school students with a member of Carnival’s and the HEAT’s management team who provide a first-hand look at the business world and real-life work experience. The scholarships were purchased by Carnival through the Florida Pre-Paid Scholarship program which matched the company’s contribution on a dollar-for-dollar basis. Scholarships were awarded based on academic performance, mentor recommendations, and face-to-face interviews with the scholarship committee. Over the past nine years, Carnival has purchased more than 100 scholarships with a total value of $1.5 million and over the past three years, 42 students have been awarded scholarships which can be used at any Florida state university or college. The company plans to continue awarding scholarships on an annual basis.